As the beauty of autumn sweeps through Louisville, we have an announcement that’ll sweep you off your feet. An entire new section of garden homes has just been released at Shakes Run, giving you an opportunity to be among the first to claim a low-maintenance residence in this picturesque location. From the gorgeous tree lined entrance to the spacious homesites, this magnificent community offers privacy, serenity, and luxury unlike anything else in Eastwood. While the Shakes Run clubhouse is the perfect setting to relax with family and friends, the expansive pool is ideal for swimming when the weather warms up. 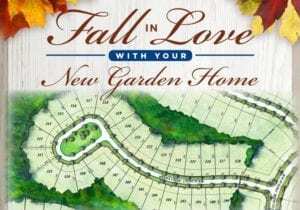 But since the new section just released is in the Garden Home division of Shakes Run, these homes offer even more. The Garden Homes at Shakes Run give you more by allowing you to do less. Enjoy more relaxation, more enjoyment, and more free time, because you’ll be doing less yard work, less landscaping, and less home maintenance. At the Shakes Run Garden Homes, the homeowners association handles things like mowing the lawn and irrigation so you don’t have to. And since it’s a new-construction energy-smart home, it’s build to the highest standards and utilizes innovative energy-efficient materials, meaning you won’t have to deal with the upkeep and energy costs associated with having an older home. To learn more about the incredible lifestyle you can enjoy at Shakes Run, contact us or visit the Sales Center at 2403 Irish Bend Court, Louisville, KY 40023 and tour the models.